To allow a test retake or not to allow one? That is the question! When I was in school, there was never a question about being allowed to retake a test or rewrite a paper for a better grade. The score you received was the one that permanently stayed in the grade book. However, in recent years, many educators have made a strong case for allowing retakes because of how it benefits students. It has created a debate that can divide teachers and administrators. This ongoing debate is fueled in part by tradition and also by misinformation. We hear things like, “Kids have always had one chance to take a test, why should we change that?” or, “I don’t want to reward their failure.” However, this mindset gets in the way of student success and hinders their ability to turn in their best work. Here are some of the most common arguments for not allowing retakes and reasons why those arguments just don’t hold up. Argument: They should have learned it the first time. Students should learn the information the first go-round, and a negative grade is just a reflection of their lack of preparation. Counterpoint: We all fail now and again. Any piece of IKEA furniture that I have and can use correctly is the result of me attempting to build it, realizing halfway through that I did something wrong, and trying again until I got it right. I’m glad I didn’t have to be stuck with a dresser with the knobs on the inside because I wasn’t allowed to fix it! Failing is part of the learning process. If students don’t fail, then we are just giving them material that they already know. My goal is to challenge them by introducing problems they have never encountered so that they truly work to find the solution. And that just might take some trial and error. Argument: Failing is a good life lesson. This is another version of the idea that students should have learned the material the first time. Only now, there’s a bit of empathy. Counterpoint: We should be assessing knowledge and behavior separately. I care about teaching life lessons as well: Treat others how you want to be treated. Honesty is the best policy. And most importantly: Failure doesn’t get to define us. We run a great risk when we allow behaviors and life lessons to determine whether students know the material. We should separate the assessment of behavior from understanding. Both are important, but they are totally unrelated. I am not sure what life lesson I took away in high school from failing yet another quiz on balancing chemical equations, except for a lifelong hatred of chemistry! Perhaps with more remediation, I could have mastered that content. Argument: It will make my class too easy. Our job is to prep them for life and college, and both of those require rigor. Therefore, my class needs to be difficult. Counterpoint: Don’t water down the content. There is a big difference between holding rigorous standards and making sure students reach them. Do all of my students end my class with an A? Nope! Do I still have a student or two who doesn’t try? Yep! But I give students all the ownership over their grades and allow them every opportunity to leave my class ready for the next level. And I do this without sacrificing content. The retakes that I assign are equally as challenging as the originals, so it is up to the student to prove they know the material. Argument: Where do we draw the line on retakes? If we give a student who received a poor grade an opportunity to redo an assignment, then we have to allow everyone that same opportunity. Counterpoint: Allow retakes for all of your students! This is where the teacher gets to set their own policies. Some teachers may set a certain percentage cutoff (for example: students must score below a 60%). Others may set a cap to the amount of percentage points students can earn. This becomes a deeper argument about what grades actually mean. Personally, I care more about my students mastering the content than them moving on to the next unit with a failing grade. I allow all students the chance for retakes, and their new score is their final score. Argument: Retakes double the amount of work to grade. Do you know what’s better than grading 120 research papers? Grading 120 more because they weren’t done right the first time! Why should we have to put in more work because the students didn’t put the work in the first time? Counterpoint: Make them earn it! In reality, on any given assessment, there will probably be 5–10 students who actually need to retake it and an additional 5–10 students who just want to. In my classroom, if a student needs a retake, they must put in some extra effort to be given that opportunity. Failed a reading quiz? Go back and take a page of notes on the chapters that were assessed. Failed an essay? Bring back a new outline or graphic organizer showing you are ready to do it over. 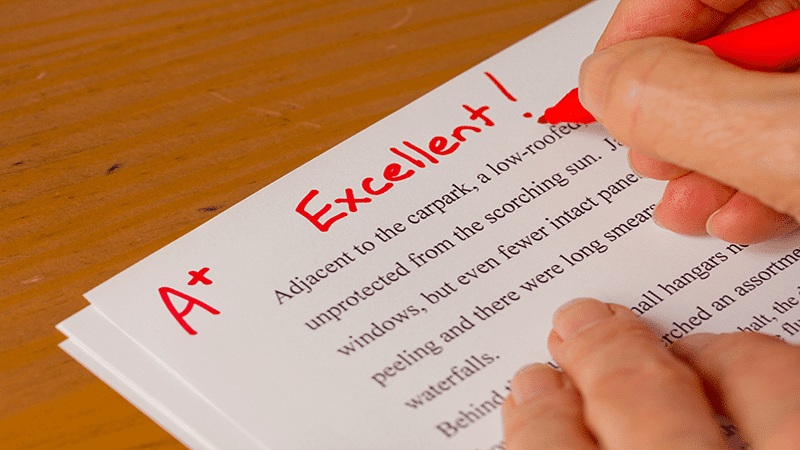 Making students earn a retake is an effective way to reduce the amount of second-grading you will have to do, and students will also prove to you that they are ready to be reassessed. Argument: They have plenty of chances to improve their overall grade. One F isn’t going to kill their grade, so why bother allowing them to retake something that won’t have that much impact on their final grade? Counterpoint: Because it’s not about the grade! Reducing grades to a mere averaging of points is problematic. This sentiment devalues the education process and tells students we don’t actually care about what we are assigning. We are sending the message that the material is not important enough to spend more time on. If a student doesn’t understand concepts, like finding area or curves/functions, they will continue to struggle on additional concepts, like integrals. Curriculum builds upon itself, so we have to ensure students master all parts. In the end, if we are truly about learning, shouldn’t students be allowed to fix their misunderstandings in hopes of mastering the content? Isn’t mastery the goal of teaching? While it may take a shift of mindset to allow retakes, the benefit is more knowledgeable and successful students, and as a result, more successful educators. Plus, check out 10 ways to know if your assessment is meaningful.